"Princeton researchers have found a simple and economical way to nearly triple the efficiency of organic solar cells, the cheap and flexible plastic devices that many scientists believe could be the future of solar power. 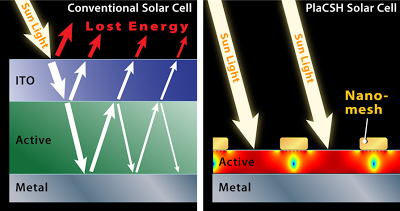 The researchers, led by electrical engineer Stephen Chou, were able to increase the efficiency of the solar cells 175 percent by using a nano-structured "sandwich" of metal and plastic that collects and traps light. Chou said the technology also should increase the efficiency of conventional inorganic solar collectors, such as standard silicon solar panels, although he cautioned that his team has not yet completed research with inorganic devices."